We have experienced a wonderful and humbling start to the new year. God’s provision has been amazing – of course, with the God we serve, how could it be anything less? Let me share some of His blessings. ***We now have a supporting church in Texas! What a privilege to be a part of the Immanuel Baptist Church missionary family in Decatur. 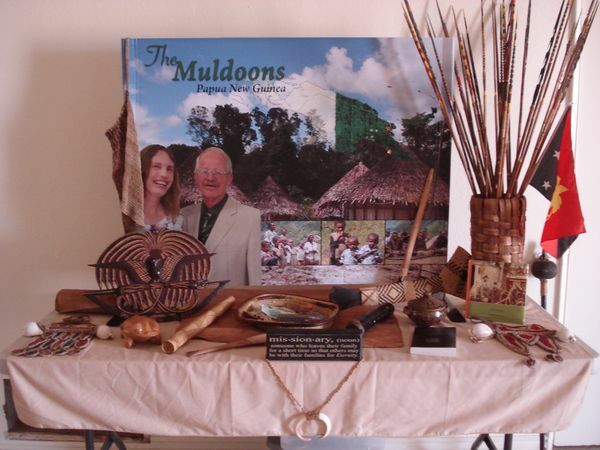 ***We were a bit concerned about what we would put on a display table, not yet having been to Papua New Guinea. No worries – God has been storing items for us here in Texas! We were introduced to a retired pastor who had taken several trips there and had returned with some great items: a bow and a variety of arrows, pottery, baskets, bilums, money, war axes, wood carvings, jewelry and lots more! He also gave us three Pidgin-English New Testaments. We were hesitant to receive these gifts as we felt they must represent many memories for this man and his wife. They, however, were thrilled with the prospect of these things being used in ministry and perhaps assisting in getting another missionary to this needy field. ***Many of you have been praying with us about the funds needed for a survey trip, recommended by both our pastor and the Allens. So, after getting some suggested dates from Brother Allen, I asked Trina to look on line for tickets. Wow – ouch!! The best she could find were tickets for $3000 a piece. They were so expensive, Trina suggested I consider going alone on that trip. I did bring it to prayer, but I knew God desired us both to serve there, and He was not short of funds! If I could not trust Him for both of us now, how would I do it on the field? So we decided to see if the travel agent that our daughter Rachel used could help us. While waiting over a weekend for his reply, a staff member here told me to be sure and let her know when we got our ticket prices as a “Muldoon Survey Trip Fund” was available to assist us! The agent found us tickets for $2000 each and said he could hold the reservation for 24 hours. I went to find out how much was being contributed – wondering how I would come up with the rest. When I asked the contents of the fund, I was asked in return what the cost of the tickets was – and told that a check would be written to cover the WHOLE AMOUNT! Yes, I did have some kind of Bapti-costal fit out in the driveway! We will leave June 29th and return August 11th. What a mighty God we serve! In the month of March I will have the opportunity to present the ministry six times, four here in Texas, and two during a spring break trip to Arizona. Pray that God will open the heart of these church families towards the work He desires among the tribal people of PNG. Also, please keep Trina’s lost, 94 year old father in prayer as we will see him during the Arizona trip. We are so grateful for all of you holding us up before the throne of grace and sharing your provision that we might pursue this ministry.